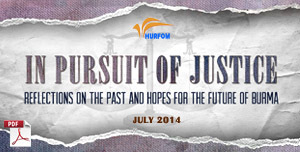 HURFOM: In what should have been a time of solemn remembrance, villagers’ deep-rooted fears of the military were brought to the surface owing to an encounter between the Mon National Liberation Army (MNLA) and the military, and another between the military and civilians. On March 15th 2019, during the funeral ceremony for the venerable Abbot of Rehmonnya Nikarya Kaw Sein Monastery in Maw Kanin village, Ye Township, MNLA troops hired to provide event security were confronted by soldiers from Burma Army Light Infantry Battalion (LIB) No. 106 who demanded that MNLA forces remove their military uniforms. Complying with LIB No. 106’s demands, MNLA troops proceeded to provide security in civilian clothes for the final two days of the four-day ceremony, which ran from March 13th to March 16th. 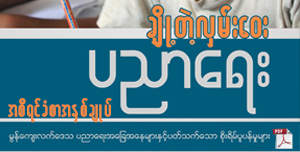 The MNLA is the armed wing of the New Mon State Party (NMSP). “Mon people want to rely on the NMSP [for security], but the NMSP can do nothing when Mon people are oppressed by the military. 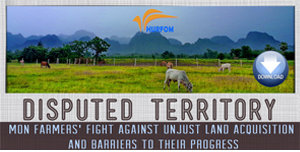 The Mon people are not safe in the presence of the military, but the NMSP can’t provide protection for the Mon people,” said Nai S—, a resident of Maw Kanin village. According to Nai S—, on the same day that MNLA troops were instructed to trade their uniforms for civilian clothes, a lieutenant and three soldiers from LIB No. 588 hit three Mon pedestrians with their car while driving to the funeral ceremony. In response, friends of the three injured boys smashed the car’s windshields. Neither the lieutenant nor the three soldiers were injured in the attack, and it is unclear whether they have been held accountable for striking the boys with their car. “I think they did this [hit the boys] because they weren’t invited to the ceremony. This place [funeral grounds] is very close to their battalion. They don’t like that Mon soldiers are wearing military uniforms when providing security. Maybe they want to oppress ethnic people. Mainly, I think they want to test the strength of the NMSP. The NMSP always gives in to their demands. If things continue like this, there will be more oppression against the Mon people in the future,” said U Taw Ba Na, the Abbot of Maw Kanin Monastery. According to Nai Nyan Tun, the Chairperson of the NMSP in Dawei District, MNLA troops are not permitted to wear their uniforms because the NMSP has signed the Nationwide Ceasefire Agreement (NCA). In the eyes of the military, the public appearance of uniformed MNLA troops suggests that the MNLA and the military have not entered into a peace agreement, despite the signing of the NCA. “Because we are in political dialogue [with the government and the military], we have to act accordingly. We were promised that after signing the NCA, there would be more political dialogue to follow. But the government and the military are not cooperating with one another, and the military continues to do as it pleases. 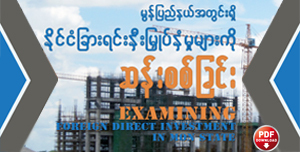 We still face many challenges, but the government can do nothing for us,” said Nai Nyan Tun. Continuing, Nai Nyan Tun stated that the NMSP does not seek conflict with the military, for when conflict occurs, it is local populations that suffer most. Since the signing of the NCA in February 2018, the NMSP has maintained peaceful relations with the military. 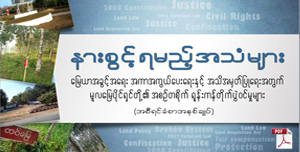 However, faith in the peace process was almost immediately undermined when in March 2018, the Burma Army Southeast Military Command ordered the NMSP to limit the number of attendees at public forums organized by the NMSP to discuss the NCA and other Mon political issues with Mon citizens. 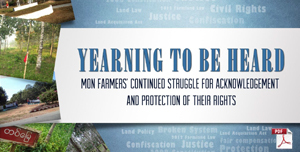 In April 2018, the NMSP’s concerns about the peace process grew due to a disagreement over NMSP representation in the Karen State and Tenasserim Division Joint Ceasefire Monitoring Committees (JMC-S). This latest dispute over military uniforms points to lingering tensions between the MNLA and the military, though it is the express fear of the military harbored by Mon villagers that is most alarming. 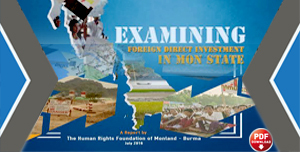 The military’s continued predations throughout Mon State, which include reckless industrial operations that jeopardize the health of Mon communities and damage the natural environment, land confiscations, surveillance, and extrajudicial killings justify such fear, and only underscore the impunity with which the military operates while claiming to be invested in the peace process.